Delivering Maximum Oxygen Concentration During Endoscopy & Conscious Sedation! 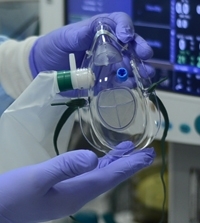 The Panoramic Oxygen Mask (POM) is a versitile multi-port capnography mask that allows for most types of scopes, probes, and tubes to be inserted through The POM’s oral or nasal membranes while maintaining a high percentage of oxygen delivery to the patient. While maximizing oxygen delivery, The POM also allows for end-tidal capnography monitoring for increased patient safety. With self-healing membrane technology, The POM can be utilized for patients’ postoperative recovery. The POM can be utilized as either a high concentration or medium concentration oxygen mask. No other oxygen mask on the market can outperform the Panoramic Oxygen Mask!